Hey folks, Jason Lenzi here again, with more exciting news. Bif Bang Pow! 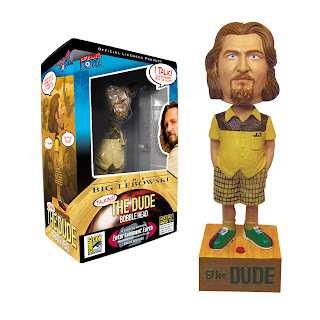 is proud to announce it's very first exclusive, just in time for this year's San Diego Comic Con: The Dude Talking Bobble head! He'll be limited to just 1000 pieces, and will sell for $20.00. This being a SDCC exclusive, it's even more special, cause it's R rated! That's right, some of the more colorful lines you've come to know and love are taken directly from the film and will pour forth from The Dude's sweet bowling lane base. So get on down to San Diego and grab 'em before they're off like Maude's overcoat! You can pick up your pre-paid merchandise at the Entertainment Earth booth beginning when Comic-Con opens on Preview Night—Wednesday July 25, 2007 through 11:00 am on Sunday, July 29, 2007.This "R" rated talking Dude has a lot to say! Packaged in a collectible window box, this limited edition resin bobble head is limited to just 1,000 pieces. The Dude comes dressed for a day of bowling. He's even wearing a hair clip to keep his shaggy mane out of his eyes! Press the button and he'll say 8 separate phrases from The Big Lebowski including, "Nobody calls me Lebowski, you got the wrong guy. I'm the Dude, man! ", "He **** on my rug", "Man, if my ******* ex-wife asked me to take care of her ******* dog while she and her boyfriend went to Honolulu I'd tell her to go **** herself. ", "Careful man, there's a beverage here, hey! ", "Oh, **** me, man! ", "I'm sorry, I wasn't listening. Ow! ******* Fascist. ", "Oh, the usual. Mmm Bowl. -uh Drive around. Uh, The occasional acid flashback. ", "Yeah well, the Dude abides."